Q: Would you say that barring any injury or anything that the ultimate plan would probably be to redshirt Spencer Sanders this year? Two things on this quote. First, he said “right now.” Always be lawyerin’. Second (for the uninitiated) the new college football redshirt rules allow you to preserve redshirts for student-athletes who play in up to four football games this season. That is, Spencer Sanders can play against Texas, Baylor, OU and West Virginia and still be a redshirt freshman in 2019. Gundy didn’t say he wouldn’t play. He just said he was planning on redshirting him. Anyway, this all seems to be coming to a head, even if Mike Gundy is currently denying it. We spoke with Bill Haisten of the Tulsa World on Thursday, who dropped some knee-weakening quotes on Sanders’ development. “He’s the most gifted guy on the roster at that position,” continued Haisten. “I’m basing that on what I saw out of high school. In high school, he was dynamic, he was phenomenal. He was the Dave Campbell’s Texas Football Player of the Year. Sanders is the franchise. Not the first time a Sanders has been the franchise in Stillwater, but maybe the last. He’s the future, and he’s about to become the present. I said this on the podcast we did with Bill, but it almost feels like we’re treating him as if he was Mason Rudolph coming out of high school. Rudolph was well-regarded coming out of South Carolina. A top-300 player nationally. Sanders was the best high school player in the state of Texas in 2017. And to me the cacophony is getting too loud for Mike Gundy to ignore. When even Robert Allen is saying things like, If the future quarterback in the program is a right answer and you think he has the possibility of success then you have to consider that, then you know it’s almost time. The other thing that Haisten brought up was the tweet from Sanders’ mom last week during the Kansas State game. A cursory scroll through her timeline doesn’t reveal much about playing time or OSU games, it’s mostly a collection of animal videos. But on Saturday, it got real. Please give my boy a chance… Spence Sanders #okstate ? The word “transfer” was thrown around a bit on our pod, and while I don’t think that’s imminent or anywhere close, there’s certainly a burden to not let it gain any steam at all. Oklahoma State should (and probably will) play Spencer Sanders over at least four of the final five games for three reasons. 1. The redshirt rule: As noted above. 2. OSU needs a spark: Sanders might not be the spark they need, but he’s the shortest distance between two points. The easiest salve to what ails them. 3. The future is here: You’re no longer playing for 2018. If Sanders is great, you get the added bonus that you could go to a bowl game (like 2014) and a whole lot of offseason excitement. If he’s not, he’s still the guy. You’re simply speeding up his development. Regardless of what happens the rest of the season — good bad or indifferent — Sanders is still going to be QB1 in 2019, so, with so little to play for the rest of this season, why wouldn’t you begin that process right now? I’ve been saying this for the past two weeks, but it feels so blatant to me that Sanders is going to be great and that in two years we’re going to talk about Cornelius-Sanders like we talk about Garman-Rudolph and Cate-Weeden. That might not be the case — and Gundy gets a little bit of a bad rap when the reality is that Sanders probably wasn’t ready in Week 1 or Week 4. One source I talked to last weekend said that the discussion around No. 3 was the same as it was around Rudolph when he was a true freshman. Not ready early. Not ready in the middle. Probably ready late. We’ll see if that’s a reality and if Sanders can even come close to replicating what Rudolph did in 2014. 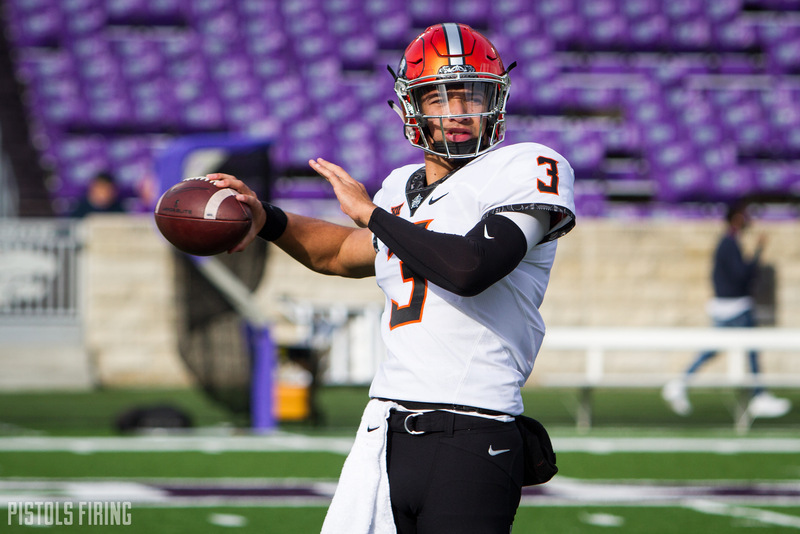 If OSU gets even 75 percent of what Rudolph did against Baylor, OU and Washington, then a “still retaining four years of eligibility” Sanders coming back as QB1 in 2019 will be the hope OSU currently lacks. Something to get us through what could be a long rest of the season and an even longer offseason.